The undefeated UConn Huskies are known as a powerhouse team with 11 National titles under their belt, and their skills were evident on Wednesday night against UCF, as the Knights fell 55-37 at home. While UConn (23-0, 11-0 AAC) built up a lead that UCF (16-8, 8-3 AAC) could not recover from, the Knights held the Huskies to 55 points, their lowest point total all season, which is much less than their average 91 points per game. UConn was stronger than UCF throughout the game, despite missing sophomore guard Crystal Dangerfield, a key player for the Huskies. With 38 rebounds compared to the Knight’s 29, and 16 assists, the Huskies were able to keep the Knights from scoring on multiple occasions. The Knights utilized a press defense the whole game to make up for their shorter players, which speaks to the growing physical fitness of the Knights. Offensively, UCF used their time handling the ball strategically, trying to force UConn to play defense longer so they could control the tempo and keep the Huskies from scoring on too many fast breaks. UCF was down 37-12 going into the half but started the third quarter with more energy. The Knights outscored the Huskies in the fourth quarter 17-7, narrowing UConn’s lead, but not by enough to get back in the game. Sophomore guard Kay Kay Wright and Redshirt senior guard Zakiya Saunders lead the team offensively with 12 and 13 points, respectively. Redshirt junior forward Nyala Shuler lead defensively with seven rebounds. The Knights were gaining ground, but the Huskies dominated the hardwood with a fast paced offense and consistent baskets throughout the game that helped them secure the win. 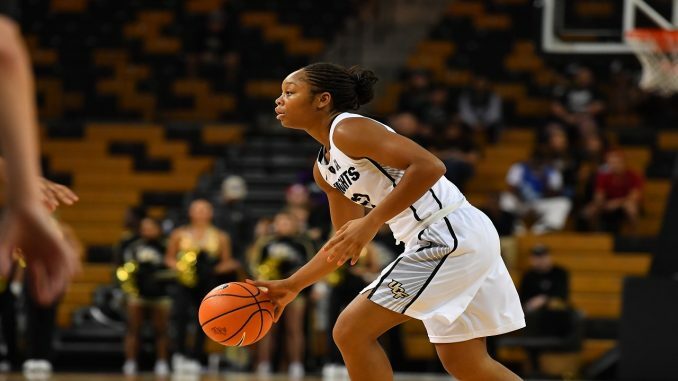 The Knights will travel this weekend to take on Temple on Saturday, February 10 at 2:00 p.m.
Taya Britten is a staff writer covering UCF Volleyball for Knight Sports Now. You can follow her on Twitter at @tayabritten.